• A high proportion of households are owner-occupied. • Of the 22 million or so gas consumers, over 14 million have central heating and rising. This is essential to absorb the heat dumped into the cooling water. • All consumers are linked to a reliable grid electricity supply, necessary to import power when necessary. 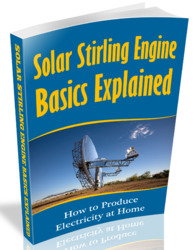 • The ratio of heat demand to electricity demand in a typical house is —5:1, which is compatible with the heat-to-electricity ratio output of the Stirling engine. • As an addition to a conventional central heating boiler the target pay-back time is 3-4 years. This may reduce as the price of gas and electricity continues to rise. 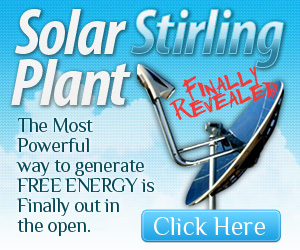 • Microgen claim that, if every suitable home in the UK used this technology, it would reduce its CO2 emissions by 25%. Sunpower Inc. is also currently developing a four cylinder free piston engine linked to a gas turbine output stage. The pistons are connected to gas compressors. The compressors are then used to drive a gas turbine. 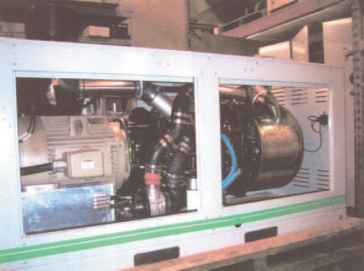 The prototype machine uses double acting compressors so that the turbine receives eight pulses of energy for each cycle of the engine. This promises to be a low-maintenance, high-reliability technology, mainly due to the absence of heavily loaded moving parts. • it is competitively priced compared with conventional boilers, taking into account the electricity generation. 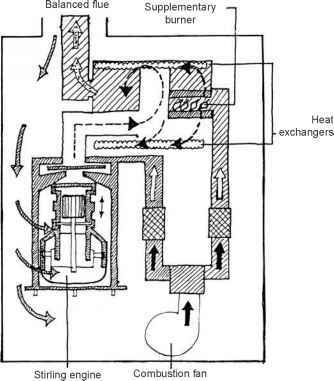 Later in the decade it is possible that the Stirling engine will play a significant part in the shift to combined heat and power in the domestic sector. This is because it is one of the few CHP units presently available which can be scaled down to suit an individual house. The Microgen FPSE 'personal CHP' can be wall-mounted to produce up to 15 kW of heat as well as 1 kW of electricity. According to MicroGen the estimated average cost saving in electricity was £200 per year in 2003. Since then electricity prices have risen considerably. Hopefully the UK government will sanction the widespread adoption of net metering on a one-for-one basis as a way of promoting microgeneration. Only then will householders get a fair deal for their home produced electricity. The situation should be helped when the whole of the EU has liberalized the electricity market by 2010 at the latest.